Barry travels into the speed force in order to save Wally. Meanwhile, Jesse decides to track down Savitar and confront him on her own while HR tries to stop her. HR is a real treasure sometimes. Episodes like this make him a vital member of the team. From his brilliant ideas to help Cisco to his advice for Jesse, HR showed his worth. I mean, how can there be a team of super geniuses standing around and the guy who isn't a genius has the best ideas? Come on, son. Also, I will always love his relationship with Jesse. It's fun. Joe didn't play a huge part in this episode, but what he did do was wonderful. His talks with Barry or Iris or anyone are always touching and meaningful. Thank you, Joe, for being a dad. I think we need more dads like Joe on TV these days. This episode rocked because of the Speed Force sequence. It was amazing to see several characters they've lost come back to help lead Barry to Wally. Eddie, Ronnie, and--can it be?--Snart! (Yes, it's true!) It was exciting to see them all, even if they weren't "themselves." The addition of the time-wraith to create conflict was good too. Overall, it was great. It was nice to see Jay Garrick again, finally. I was not at all surprised that he stayed behind to take Wally's place. (I had actually discussed this with a co-worker previous to the episode.) It was still sad to see him stay there though. I hope they find a way to get him out, but I'm not sure how. It was, however, flipping cool that Barry used Jay's helmet to get out of the Speed Force. Magical. While I have to give Jesse props for being brave and determined, her actions were reckless and frustrating in this episode. She did learn a weakness of Savitar, so I can't be completely irritated by her, but I don't understand how she even got close to Savitar when Barry and Wally weren't fast enough. It seems too convenient--or the result of shoddy writing. Either way, I'm sad to see her go. I knew she couldn't stick around forever and I'm glad she's leaving for a good reason (instead of dying at Savitar's hand or sacrificing herself to save Wally), but it hurt to watch her leave Wally behind. Poor baby. Wally is just a mess right now, and my fangirl heart just hurts watching him suffer. He's been having a rough time, and he just needs a hug. Can we leave him alone for a few episodes to let him recover? I mean, honestly! I'm just kind of done with Iris and Barry at this point. Iris is being a jerk, but the minute Barry is in danger of being "lost" for good, she completely changes her mind. Arghhh! And then Barry returns only to say they need time apart. What? WHAT?! No, no! You need to stick together. They're both idiots. This is probably going to be the reason Savitar grabs Iris so easily--because they split up. For the most part, Barry was great in this episode, and Grant Gustin did a fantastic job acting. But the whole "I have to save Iris myself" thing was annoying. I guess I get it? Like he has to do it to prove he's a hero and doesn't ruin lives, but why can't Jesse and Wally and Jay Garrick help him? 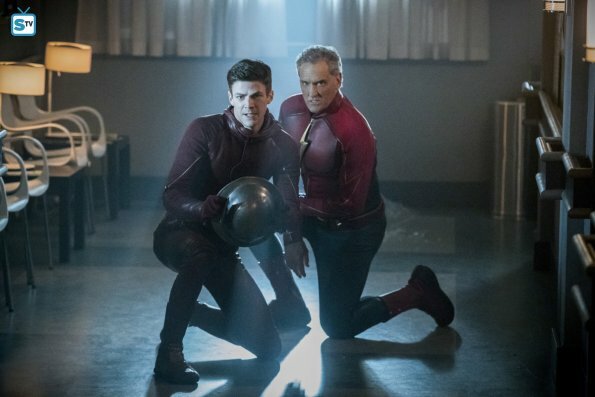 I really don't think they can stop Savitar one-on-one. It hasn't worked before. The only way they are going to stop him is if they work together. It'll be a lot harder for him to stop them if there are four speedsters coming after him. Come on, Barry. You're smarter than this. This episode surprised me because it was actually exciting. I love when Barry has odd encounters like entering the Speed Force or going into dream worlds/parallel earths. So this episode was a treat, especially since they brought back several characters to help him along his journey. Also, they finally made progress against Savitar by learning there is something under the armor. It's great. This finally feels like The Flash again! What did you think of "Into the Speed Force"?